Thank you, one and all…. To all of our customers — past, present and future — we thank you. You represent our heritage and our legacy. In this season of planning and planting, we embrace the coming winter, and look to the bounty of the spring. But there’s no rushing nature. Not even in this impatient era of “instant gratification” and “what’s in it for me” can the forces of nature be hurried. Yet, with lightning speed, we all share our joys and woes; our pleasure or displeasure with a personal experience or product purchased. We share images of our latest acquisition, mountain climbed, or newest blossom to open in the garden (the latter being our favorite always). Comments, praise, and complaints fly through the social cyber waves to our virtual doorstep. We, here at Schreiner’s Gardens, receive these messages with open arms, receptive minds and humble hearts. Social posts, emails, and letters all serve to bind us better to you, our customers. For this connection, we are grateful. For four generations of Iris (and Daylily) farming we’ve been growing our connections — building our followers, you could say. With all of you, we share our successes, because we care about what’s in it for you. Categories: bearded iris, iris, iris farm, iris nursery, Schreiner's, Schreiner's Iris Gardens, Uncategorized | Tags: bearded iris, iris, Schreiner's Iris Gardens | Permalink. Think spring. Visit us in May. From the foothills of the Coast Range in the west to the lowlands of the Cascade Range in the east, color washes across the Willamette Valley in waves of color from early to late spring. On our farm, acres of Bearded Iris open in a rainbow show beginning early to mid-March, with the colors continuing through late May to early June. Patch by patch, the Dwarf varieties to the grand Tall Beardeds, take their turn opening blooms in a dizzying array of color combinations. Our 10-acre Display Garden, located here on our farm since 1947 (Schreiner family history), is dedicated to the display of Tall Bearded Iris. Nearly 500 named varieties are planted among spring-blooming perennials for a well-rounded display of form, texture, and COLOR! Plan your trip to visit during our Bloom Season Open House, May 11 to May 31st this year. Categories: bearded iris, Companion Plants, Dwarf Bearded Iris, iris, Iris Bloom Season, iris farm, iris nursery, public garden, Schreiner's Iris Gardens, Uncategorized | Tags: Garden Design, iris, iris garden, public gardens, Schreiner's Iris Gardens, Tall Bearded Iris | Permalink. Ralph Waldo Emerson said when he went into his garden with a spade to dig a bed, he felt such exhilaration and health, that he felt he’d been defrauding himself all the time in letting others do for him what he should have done with his own hands. We need places of reverie and reflection. It feels good to put work aside, relax and enjoy the garden. To just relax on a bench and quietly gaze upon the landscape. The cares of the world quietly slip away. Idly strolling among the Iris, unexpected delights endlessly appear. Captivating juxtapositions of color are seemingly on parade. Deep purple against a glowing orange, an icy white contrasting beautifully with a lavender Iris, then a brilliant gold, the darkest black, a sky blue…On it goes. Countless new colors and combinations. As Emma Townsend wrote, “Irises are the glamour pusses in the world of floral loveliness.” Time spent in an atmosphere of beauty is restorative. P.S. Please consider a trip to Schreiner’s Gardens at bloom time. Our 10-acre display of over 500 Iris cultivars, planted among a dizzying array of mature perennials, welcomes local and international visitors each May. Call our office or visit our website for more Bloom Season details. 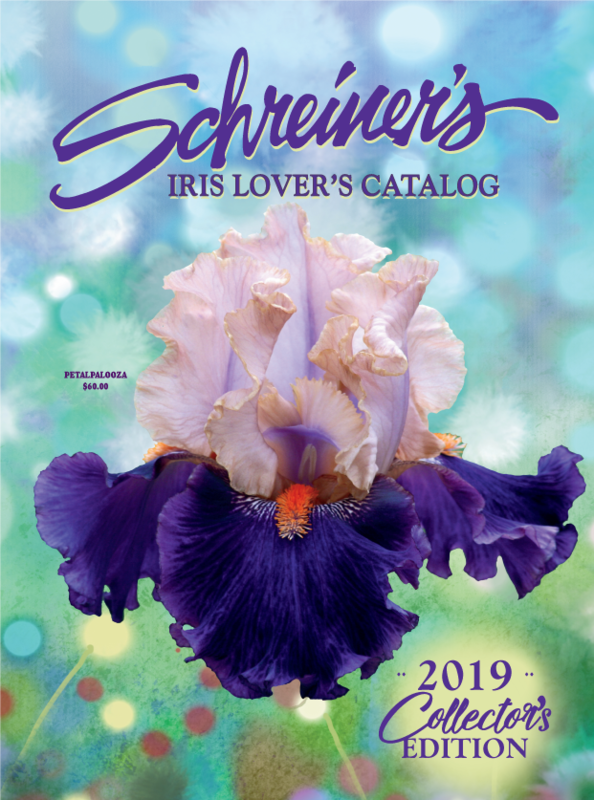 Iris Lover’s Catalog now available online. Categories: bearded iris, Companion Plants, Garden Design, iris, public garden, Schreiner's Iris Gardens, Uncategorized | Tags: flower garden, Garden Design, iris, iris garden, public gardens, Schreiner's Iris Gardens, Tall Bearded Iris | Permalink.